(Nanowerk News) Car finish, to which no dirt particles adhere, house fronts, from which graffiti paints roll off, and shoes that remain clean on muddy paths – the material “fluoropore” might make all this possible. Both water and oil droplets roll off this new class of highly fluorinated super-repellent polymers. The Federal Ministry of Education and Research (BMBF) has now decided to fund its further development at the KIT with EUR 2.85 million. Fundamental research in this area is aimed among others at making use of this new type of material for universal protective coatings. 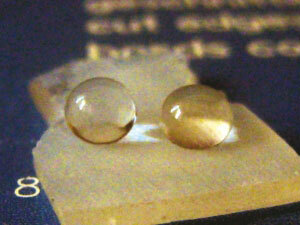 The novel material “fluoropore” repels water (left) and oil (right). These droplets do not adhere to or wet the surface. The phenomenon is known from lotus plants as well as from cabbage leaves: Water droplets simply roll off. For some time, this classical lotus effect has been used technically for producing rough surfaces with special chemical properties. “However, this trick does not work for oils – the lotus plant repels water, but no oil,” Dr.-Ing. Bastian Rapp of the KIT Institute of Microstructure Technology (IMT) says. “Oil-repellent surfaces need to have another chemical structure, fluoropolymers are required for this purpose,” the scientist explains. Fluoropolymers are high-performance plastics with a high heat resistance and chemical stability. Teflon, the known anti-stick coating material for frying pans, belongs to this category of substances. “When combining the chemical properties of fluoropolymers with the roughness of the lotus plant, surfaces are obtained, from which both water and oil droplets will roll off,” Rapp says. He has already succeeded in producing such super-repellent surfaces with the lotus 2.0 effect in the laboratory. In practical use, however, they turned out to have an insufficient stability. A big problem is sensitivity to abrasion. Rapp therefore works on developing a new class of fluorinated polymers, from which water and oil roll off and which are far more robust in practical application. These polymers, called “fluoropore”, are to possess the lotus 2.0 effect on nearly any surfaces. The research project of the young KIT scientist was recently successful in the NanoMatFutur competition for young scientists launched by the Federal Ministry of Education and Research (BMBF). Rapp’s project “Fluoropore – chemically inert, micro- to nanoporous ‘teflon’ with an adjustable wetting behavior” is granted EUR 2.85 million for the establishment of a young investigator group in the next four years. By the NanoMatFutur competition, the BMBF supports highly qualified young scientists in the areas of materials research and nanotechnology. Funds are granted to application-oriented fundamental research projects with a high industrial implementation potential. With “fluoropore”, universal protective coatings against any type of staining can be produced. An example is a coating of car window panes to prevent water from condensing and freezing in winter. Other examples are fine-pore screens, whose chemistry and structure allow for the separation of oil/water mixtures used as cooling lubricants in processing industry. In the young investigator group headed by mechanical engineer Rapp, chemical process engineers and experts of organic chemistry, materials chemistry, and process technology work on the development of the new material. “At the KIT Institute of Microstructure Technology and its Karlsruhe Nano Micro Facility, we can use a large variety of analysis and structurization methods for our work, for example, scanning force and scanning electron microscopes,” Rapp emphasizes.